Guidance on how to monitor and report incidents of pesticide poisoning caused by Severely Hazardous Pesticide Formulations. The SHPF Toolkit has been developed to provide guidance on setting up a system for reporting an SHPF under Article 6. It has been restructured in 2017 in order to make it more effective as a tool to support Designated National Authorities (DNAs) to record and submit details of pesticides incidents under Article 6 of the Rotterdam Convention and to strengthen decision making and pesticide risk reduction at a national level. It is downloadable from the RC website. To develop this latest version of the kit a multi-stakeholder process of consultation was carried out to raise awareness and active engagement with the toolkit among the primary target audience. The revised Toolkit for health incidents is based on lessons learned from technical assistance activities during 2012-2016. It uses engaging material as case studies and practical examples illustrating the process, templates for planning and budgeting and involving the different key players. 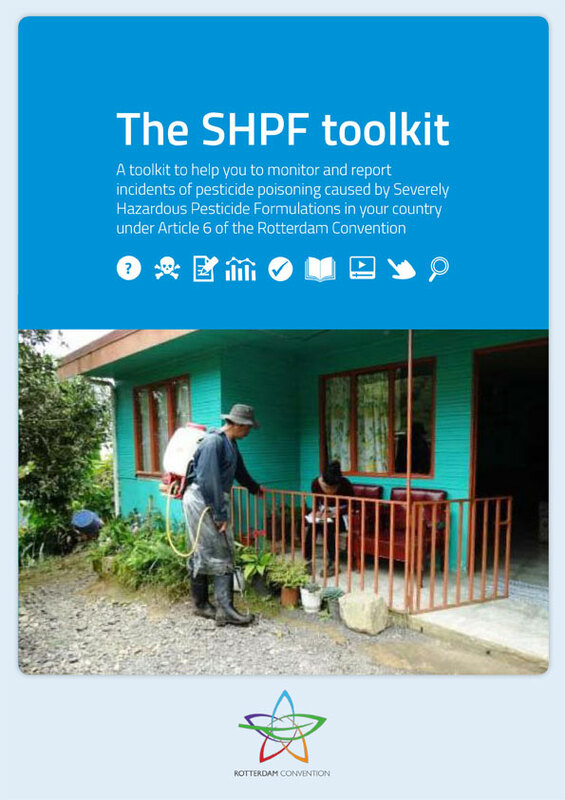 The kit is divided in 5 sections that provide information on how to navigate through the kit, how to submit a proposal for SHPF under article 6 to the Secretariat, on several methodologies for data collection and case studies, connection to other programmes, importance of communication strategies, on alternatives to pesticides and reference material (see the diagram). Click on the image below to download the SHPF Toolkit. The toolkit is also available in French, Russian and Spanish.